The May 2015 Barkbox is amazing. I managed to lose the information card while I was reorganizing my office space so this might be a review more sparse on the details this month. I get a lot of dog boxes but Barkbox tends to reign supreme in originality. This month's theme is "Garden Party" and I didn't want to share one of the items with the dogs. Seriously. I kept the bouquet. The Cost: $34/month. (That includes shipping. They've changed their pricing structure recently). 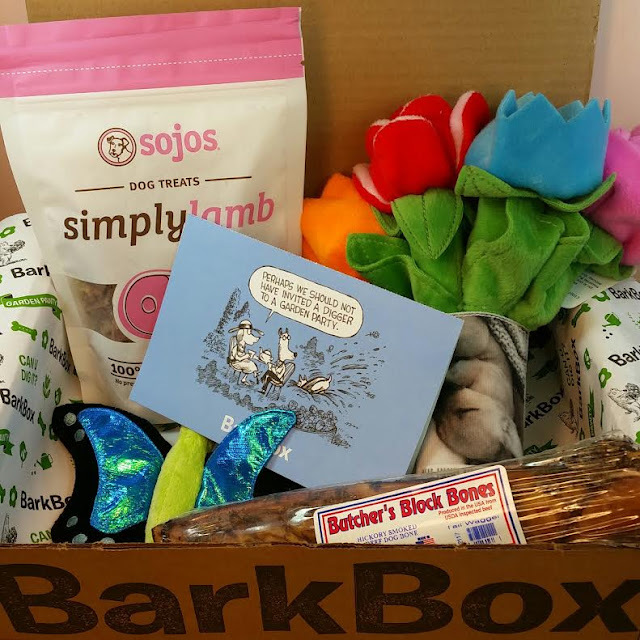 What You Get: Every month you will receive a box in the mail with four or more carefully selected products and presents for your dog – anything from toys, bones and all-natural treats to hygiene products and innovative new gadgets! Barkmade Barkquet-Do you see this?! It's four flowers wrapped in newspaper! There's a tulip, a rose, and two others that could be anything. 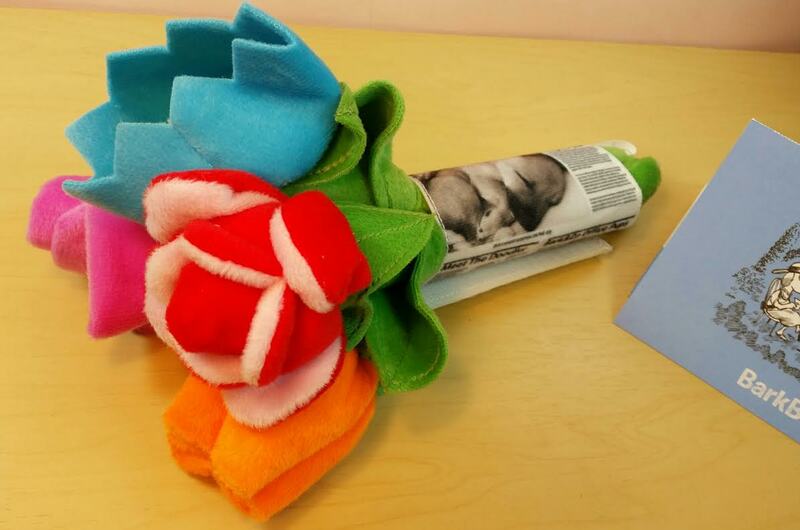 Each flower has either a crinkly filling or a squeaker. SO cute! The newspaper that holds them all has a velcro strip and has little silly dog articles printed on it. Really, really cute. I tried to hide it from Bugsy but he found it. Unfortunately. I did manage to keep the red and pink flowers from him, though. I want to do something fun with them. This is Bugsy begging me to play. I had my knees propped up while reading and he kept peering over them with his butterfly, letting me know I needed to throw it again. 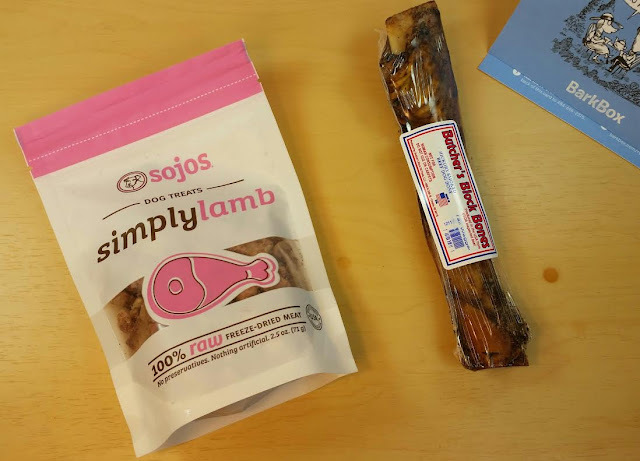 Sojos Simply Lamb- These are freeze dried lamb treats. They're kind of slimy. I've had this type of treat before although it's been liver. The dogs both love these. Maybe slimy isn't the right word. But some pieces are fatty and seem greasy. I don't know. These are not something I would carry around in my pocket. Butchers Block Bones- This is a really big bone. Dexter loves bones so he got this and he was in heaven. I did find Bugsy gnawing on it the other day, too, and he usually isn't into bones much. VERDICT: This was a fun Barkbox! Everything is useful and well-loved which is always nice. 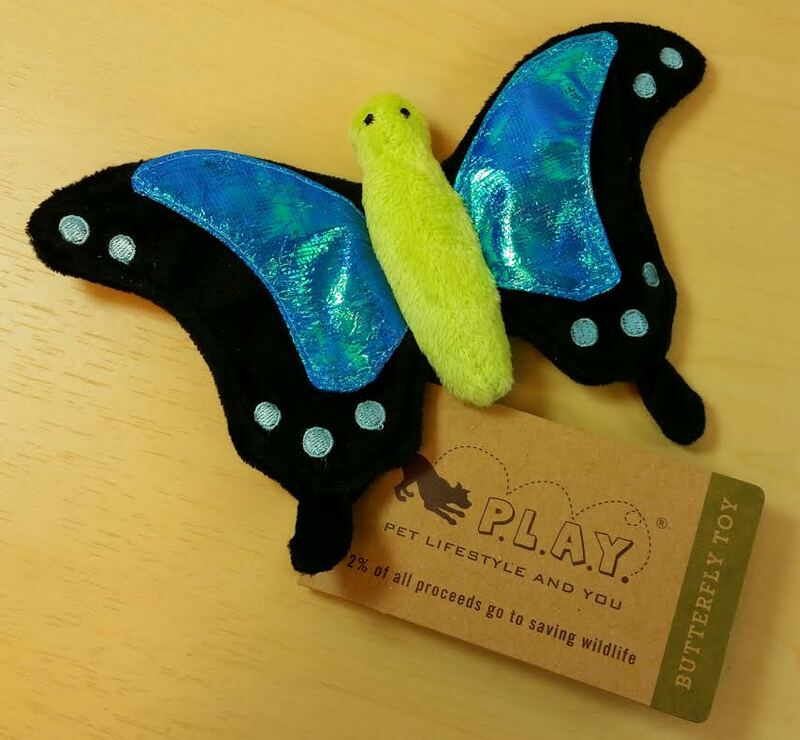 Barkbox seems to be making it's own pet toys now which is actually good. Mainly because I feel like they know what dogs will like and that's what they make. Which is the goal of every dog toy maker ever so ignore that comment. Hah! At least they're cute and they do make themes more fun. Since I lost the info card the two prices I could find for the Sojo's and the Barkquet make up $24 of the purchase price. Which means the box probably comes out around $35. With dog boxes, that's pretty good. They usually aren't double the value or anything but you save a trip to the store and you get a great array of toys for your dogs. Things you normally wouldn't even consider. 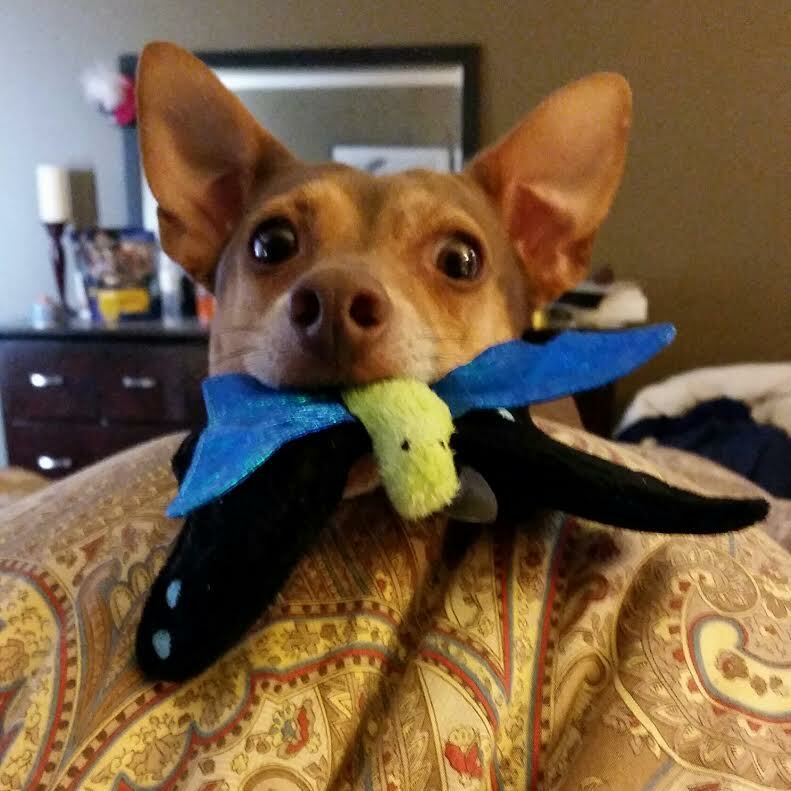 I never would have bought a butterfly toy for Bugsy but he adores it. I have a year subscription that I bought with a coupon so I think my boxes are around $17/month. Totally worth it, imo. Since I purchased my subscription, though, it looks like the plan structure has changed. It's definitely better to get at least a 3 month subscription because the month to month charges $5 shipping! If you'd like to sign up for Barkbox, you can do that here. You'll get a free box added to your subscription by using my referral link. And if you use Ebates, make sure to activate it! You'll get $3 cashback if you do. If you don't use Ebates and you shop online a lot like I do, I highly recommend them. That bouquet is so lovely! I would keep it too!